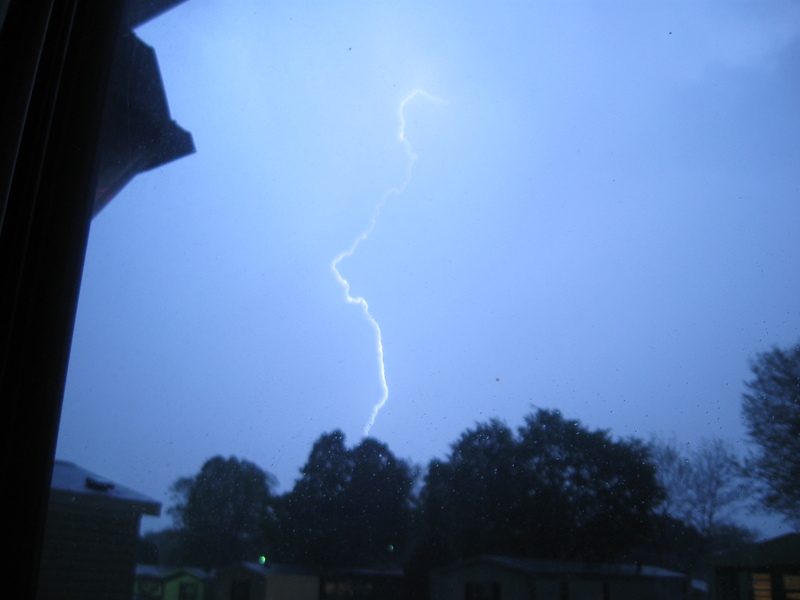 Lightning has always been a source of fascination for me, even as a child. I was never one to be fearful of thunderstorms. Watching a good lightning display is something that I really enjoy. 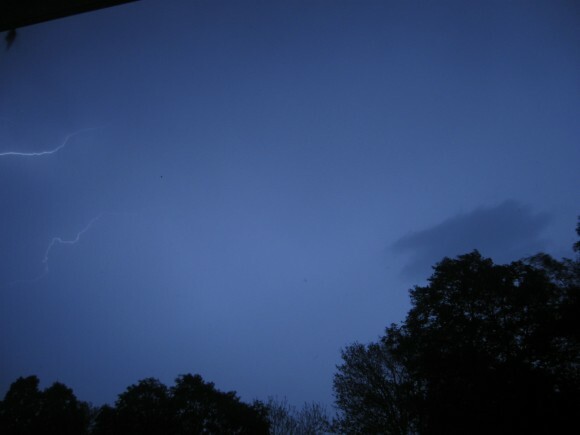 Flashes of lightning are very ephemeral. Blink your eyes or turn your head and you might miss an impressive sight. As with other events, we sometimes seek to freeze these moments of time so that we can share them with others, or simply reminisce later. 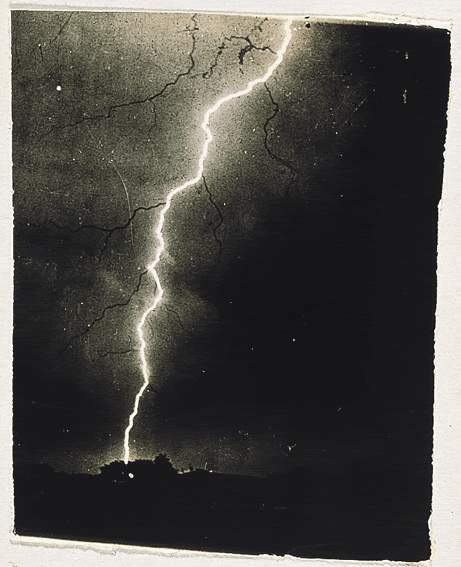 Jennings’ successful photographs helped scientists gain a greater understanding of the structure of lightning. 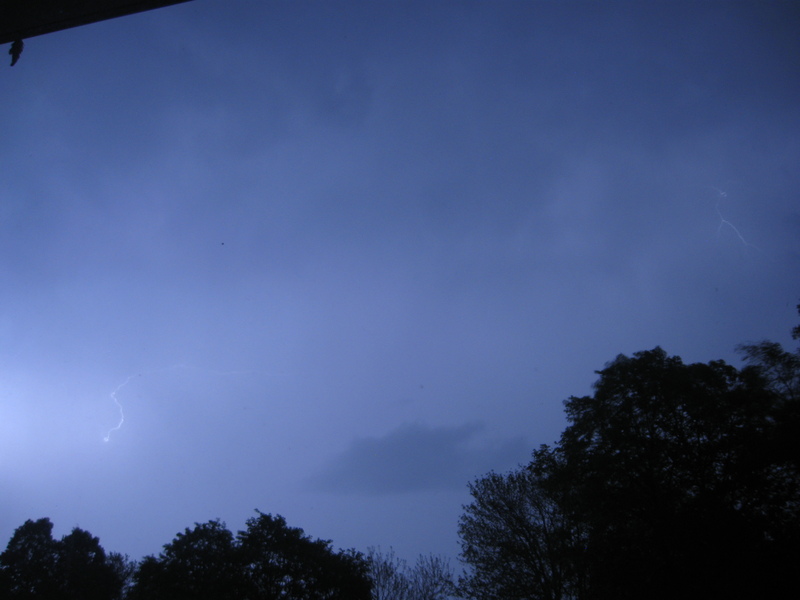 While we now have much more detailed knowledge about lightning, its formation still isn’t well understood. Some of the things we do know about it, though, can help us photograph it more easily. Though it may not be easily noticed by the naked eye, a typical lightning flash is much more than just a single bolt of electrical energy. A leader is a channel of ionized air which starts from a negatively charged region of mixed water and ice in the thundercloud. Leaders progress outward (and often downward) in a series of quick steps, each step measuring from fifty to one-hundred-fifty meters long in most cases. A stepped leader possesses a relatively small current, sometimes from mere dozens to hundreds of amperes. Though not invisible, the leader can be very difficult to see in most circumstances. 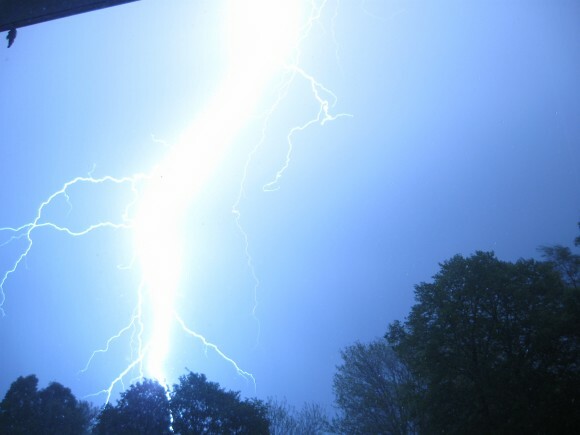 Regions of opposite charge on the ground develop positive streamers which can then connect with the stepped leader to provide a channel which can carry an immense current flow, producing the return stroke; the bright lightning flash we’re accustomed to seeing. Those return strokes, carrying currents of 30,000 to 120,000 amperes and reaching temperatures of 54,000°F (30,000°C), are the primary target for photographs. The preceding stepped leader is the key to getting those photographs easily. 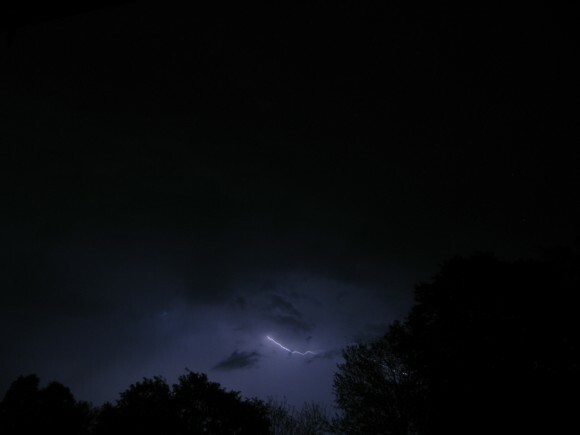 Photographing lightning can be done using any of several methods. From simply watching for the flash and snapping the shutter, to taking a long series of exposures, each several seconds long, different techniques have been used, each with their own degree of success. I use software called CHDK on my digital camera in order to have access to certain functions of the hardware that aren’t normally available to me. By the use of a script, one of these functions is motion detection. 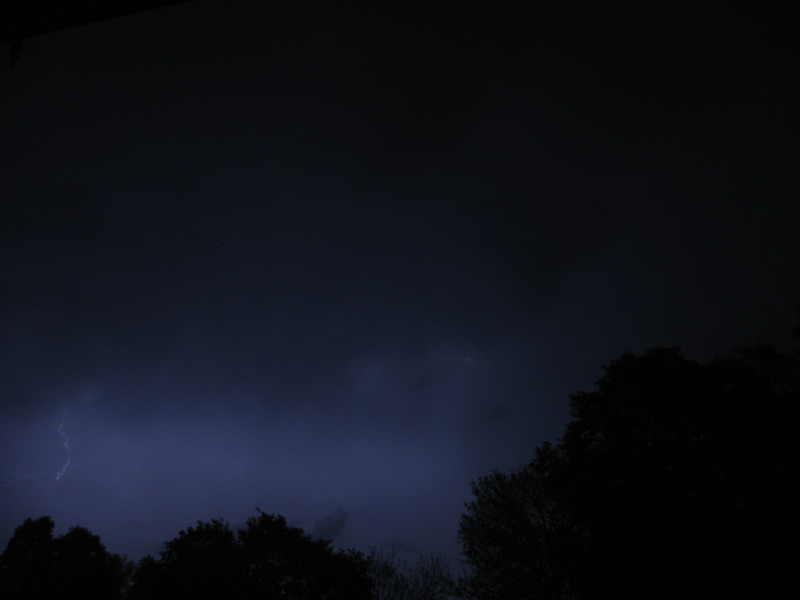 Using a multipurpose motion detection script, I was finally able to take my own photographs of lightning. The idea is for the stepped leader to trigger the motion detection, which then snaps the shutter in time to capture the return stroke. If the response is fast enough, and the leader is bright enough, then it will be captured as well. As I’m still experimenting with camera settings for this, I’m not going to go into great detail here. I’m anticipating another thunderstorm late this afternoon so that I can try a variety of settings to see what will work best. All of the following photos were taken through my kitchen window with a Canon A590IS. The camera was in manual mode, with ISO set to 80, f/2.6, and a one second exposure time. My first attempt resulted in thirty photographs. After checking the results, I noticed that the focus was not set to infinity as I had planned. These three photos were the best of that group. This one turned out rather dark. I’m not sure if the flash was at the beginning or end of the exposure. I’ll try for some longer exposures next time to see if results are improved. 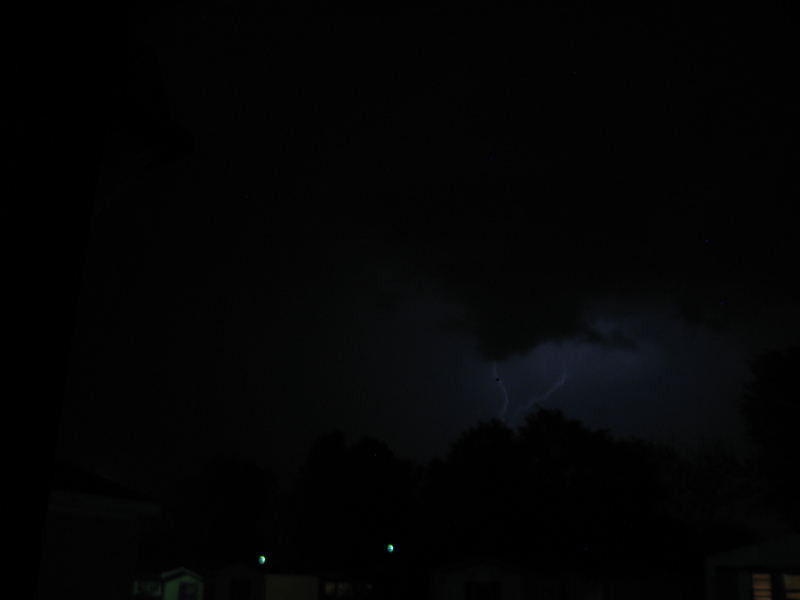 My wife remarked that it looked like lightning from an old horror movie. Being this faint, I’m of the opinion that this is simply the stepped leader itself, not the return stroke. As I experiment with longer exposures, this may become less of a problem. 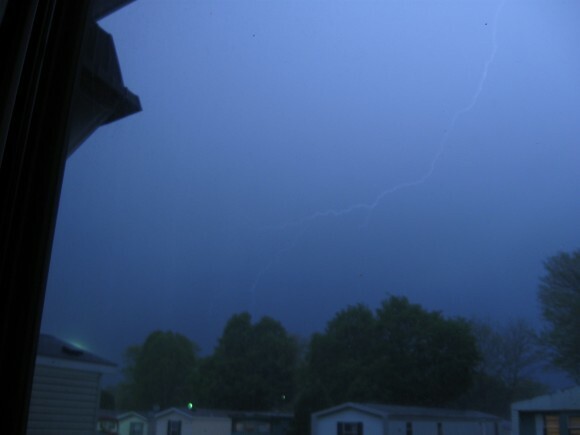 This is the first really bright lightning stroke that I was able to capture. It becomes all the more obvious that I didn’t have the scene focused properly. After quickly reviewing the first group of photos, I adjusted the focus to infinity and positioned the camera to have a slightly less obstructed view. The storm had moved further to the east at this point, appearing above the treetops to the northeast of my location. This one was quite bright and clear, angling off behind the trees. Among the very last of the photos, this one shows very distinct branching lightning just behind the trees. Multiple leaders from cloud to cloud do a good job of lighting up the sky in general. I can only imagine what was happening deeper in the cloud bank. More leaders in the clouds. They’re rather delicate looking. 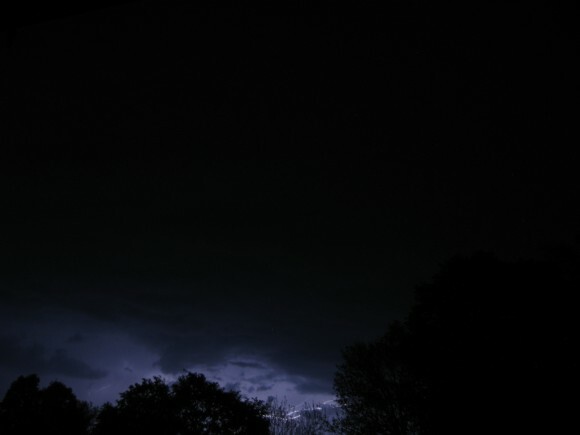 This is definitely the most impressive lightning photograph I captured that night. Many leaders branch off of the main return flash. There were probably several return strokes, each following a slightly different path. It gives a strobing impression of the primary stroke when viewed with the eye, yet seems like a bundle of twisting flashes in the photo. The rain has just begun, and I’m sure I heard a distant rumble of thunder a few moments ago. I have my camera and tripod ready. Is it wrong to be here hoping for a spectacular display of electricity from nature? I’ll certainly do my best to come up with more (and better!) lightning photographs. Good photos, soon to get even better as you refine your technique. Glad you’re inside while taking the pix though. I wouldn’t be able to do that outside! How did you find out if CHDK would work with your camera?